There are only so many ways to say “I love you,” and sometimes tried-and-true expressions of affection just won’t cut it. 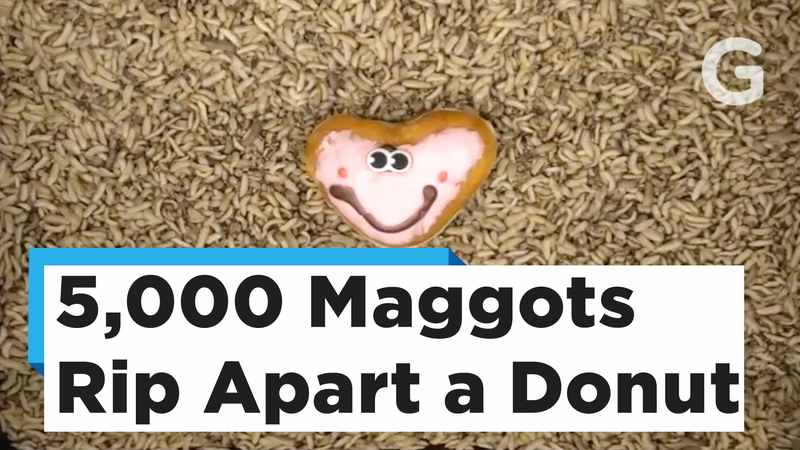 On this Valentine’s Day, you can really spice things up by sending your partner this video of wriggling maggots eating a heart-shaped donut. It so happens that these maggots have a purpose—they’re black soldier fly larvae, which could one day be used as a source of sustainable protein for humans. There’s loads of talk about the future of protein, given that raising livestock can lead to lots of greenhouse gas emissions. Many companies have considered moving to more sustainable sources of protein, including insects. Researchers at Georgia Tech, alongside an Atlanta-based startup called Grubbly Farms, are researching how to create more environmentally friendly animal feed from black soldier fly larvae. “They’re fed a diet of consumer food waste, then can be fed to chicken and to fish,” Olga Shishkov, a Ph.D student in mechanical engineering at Georgia Tech, told me. So here, you’re seeing the soldier fly larvae do their part for the planet. “I had this ridiculous donut, I thought I‘d give it to them and see how they eat it.” Nice choice!